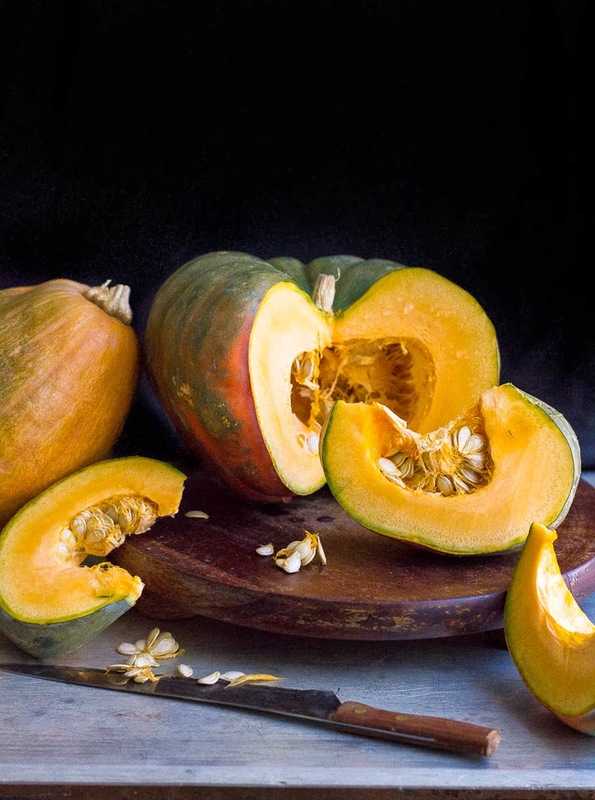 This last year when I got to spend a whole lot of time with Ammi (mom), I was reintroduced to pumpkin, a vegetable I loathed in savory preparations as a child and never quite embraced into adulthood. Infact, I was amazed at the voracity with which my siblings looked forward to the lunches that involved pumpkin. Mom doesn't fail to remind me, how growing up it was always me who loathed most vegetables and misled other kids into believing the same. I obviously didn't set the best example as the eldest child. 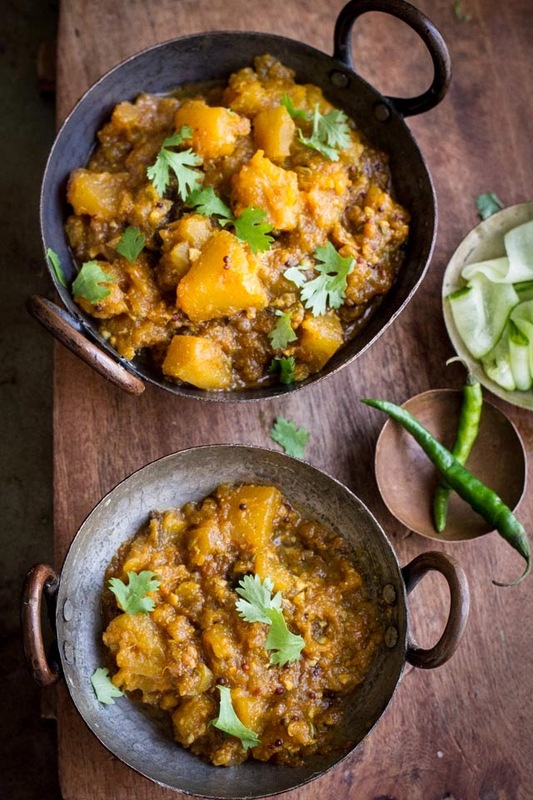 Pumpkin was often served along side khichda, which is traditional Bohra concoction of wheat, meat and dals. You see, khichda was always the star, the pumpkin served as a side that never got it's due attention as we were too busy digging our tandoori roti into the lustrous khichda. 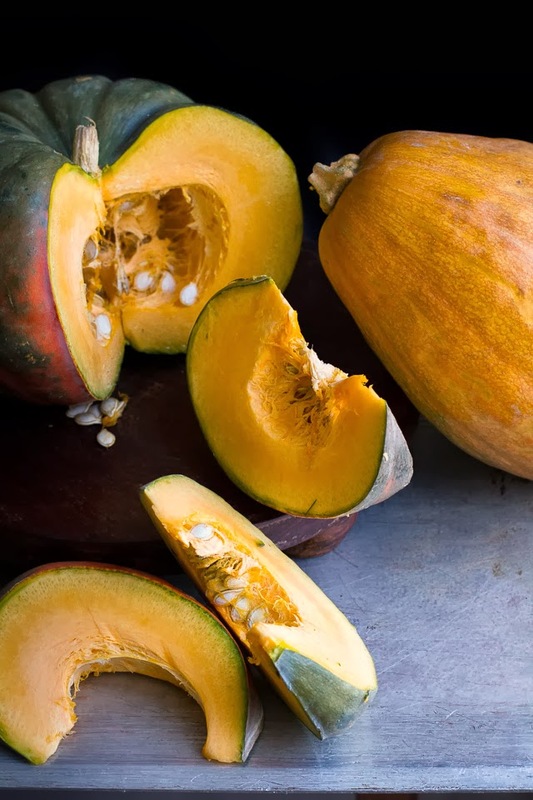 In this recipe, the sweetness of the pumpkin is enhanced with a little bit of jaggery, balanced with the tang of tamarind while the sweet flesh absorbs the spices, making it the ultimate sweet, spicy and sour experience. An experience I wish I hadn't missed all these years. Apart from serving with khichda and tandoori roti, it is served with poori (deep fried flatbread) or plain roti or naan. But is good with any kind of flatbread. * Any sweet and firm flesh pumpkin variety should work. Heat oil in a saucepan and add the mustard seeds. Once they splutter, add the ginger paste followed by all the spices. Add the chopped pumpkin and mix well so as to evenly coat them into the spices. Roast them for about a minute. Add 1/2 up water and cover and cook for 7-8 minutes or until the pumpkin is cooked all way through. Add the tamarind pulp and jaggery. Cook without cover for another minute. 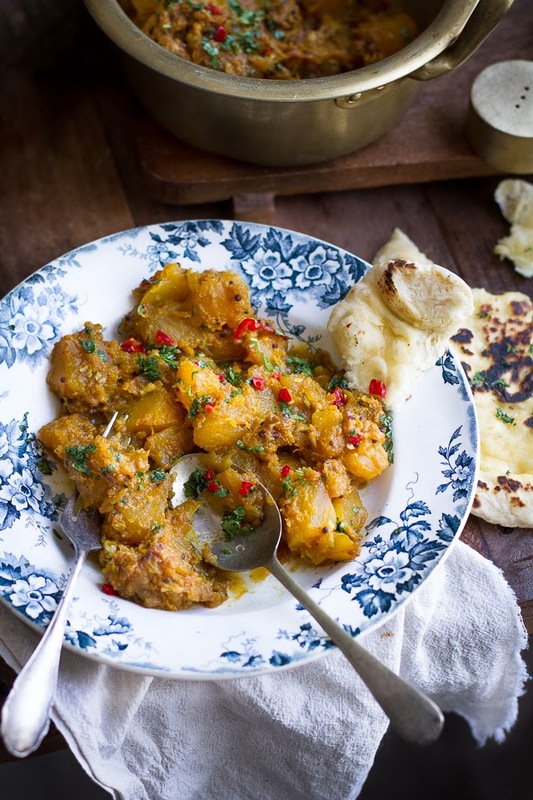 Serve with roti, puri, paratha or naan. I like to keep this on drier side but if you wish to have more gravy, cut some of the cubes smaller so that they mash and become gravy like. Also add more or less water depending on the consistency you prefer. That fall dish looks really good! Sweet and sour dishes are wonderful. Do you have any ideas for replacing tamarind if people can't find that? Laura - lemon works too, so does aamchur powder (mango powder). Doesn't taste the same but still delicious. Thanks! I was thinking lemon, and maybe a bit of maple syrup for the sweet? I have Tamarind so will follow your recipe exactly. But I am sharing this recipe with others who may not. Thank you again! 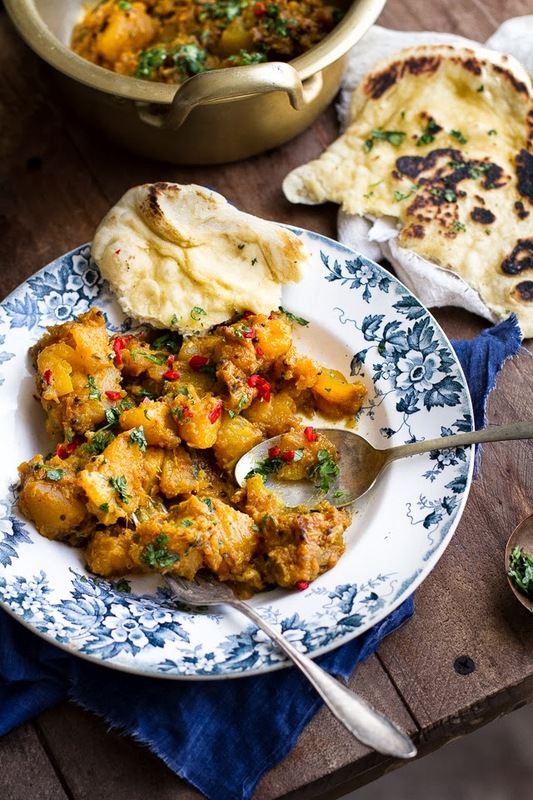 One of my favorites with pooris & aloo jhol. I make it lots of amchoor, never tried tamarind. Love! Lovely!! The colours are so tempting and inviting!! This looks delicious. I really enjoy the sweet and savory dishes. South Indians have a lot of these curries and we love it. i'm not sold on pumpkin, savory or sweet. would i be able to use squash (butternut or acorn) instead? i'm so intrigued by the use of tamarind in this dish! styled and pictured so well kulsum. i make in a similar way. That sounds delicious, good thing I have a plentiful supply of pumpkins waiting to be put to good use! I am a huge fan of pumpkins, have always been and can eat every day. Boiled, fried, mashed, anyway you give me, I will eat it! My fav dish with pumpkin is a typical Bengali dish made with fish head ( it may sound eeww to you, but you Bengalis and their love for fish :) ) Your version sounds equally delicious. I am so gonna try it soon. I only recently had pumpkin, in salad form, and it was delicious. This looks even better. What a great recipe! Thanks for sharing. One of my favourite ways to eat pumpkin! I also make pumpkin with fenugreek seeds and a bit of green chili. So delicious! Thanks for reminding me to cut my huge pumpkin I have sitting around and make this dish! Wow! 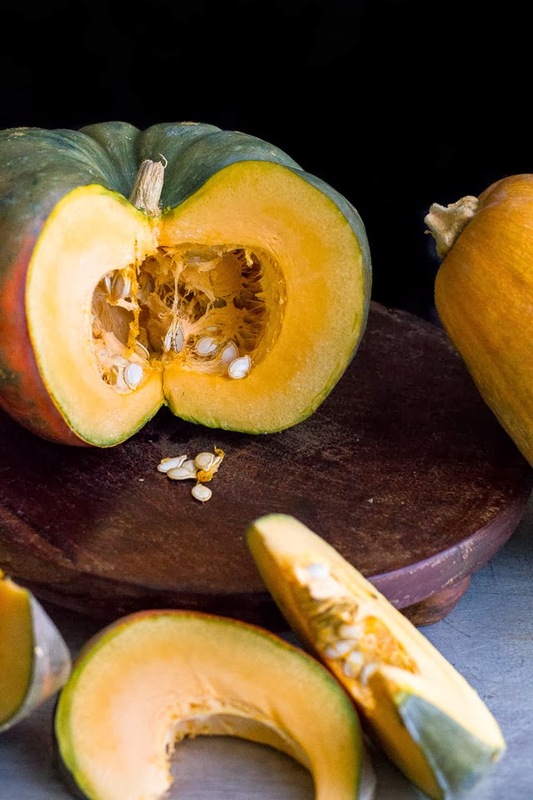 Not only delicious blend of flavors but the golden color of the pumpkin makes a great presentation. Wonderfully different way to serve pumpkin. Everyone raved and thought I slaved over the dish but who am I to tell how easy it was to prepare?